Two story & ranch condominiums surrounded by lush landscaping, 3 ponds with fountains (lighted at night) and a quaint footbridge across a central pond. Resort style amenities include tennis court, pool with attached hot tub and private cabana with changing rooms. 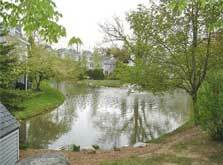 Just click below for details on recent sales or available units at the Arbors development.